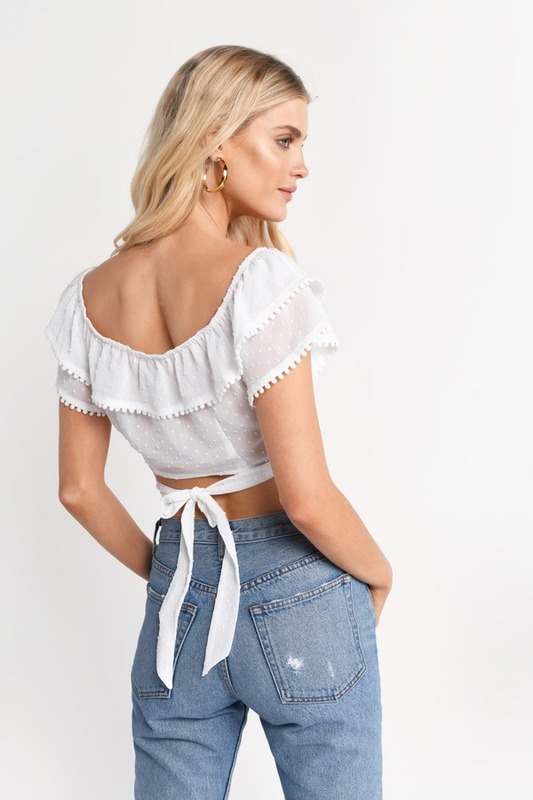 Check out Tobi's Morgan Off Shoulder Wrap Top When a ruffle just isn't enough... the Rose Morgan Off Shoulder Wrap Top has an off shoulder neckline, pom pom trim and Swiss dots all over to make all your going-out dreams come true. This ruffled crop top looks fun and flirty with the matching mini. When a ruffle just isn't enough... the White Morgan Off Shoulder Wrap Top has an off shoulder neckline, pom pom trim and Swiss dots all over to make all your going-out dreams come true. This ruffled crop top looks fun and flirty with the matching mini. When a ruffle just isn't enough... the Rose Morgan Off Shoulder Wrap Top has an off shoulder neckline, pom pom trim and Swiss dots all over to make all your going-out dreams come true. This ruffled crop top looks fun and flirty with the matching mini. When a ruffle just isn't enough... the Black Morgan Off Shoulder Wrap Top has an off shoulder neckline, pom pom trim and Swiss dots all over to make all your going-out dreams come true. This ruffled crop top looks fun and flirty with the matching mini. Black, Rose, White modeled on a size Small.